You are going to sweat more with summer's soaring temperatures, and this means that you are more likely to deal with smelly feet as well. That extra perspiration can cause all sorts of problems, and if you do not take steps to keep your skin dry, you may even have to deal with skin infections. Getting rid of smelly feet mainly involves taking steps to keep your feet dry. Many natural remedies may also help get good results. Let's find out more about it. You get smelly feet when bacteria on your feet feed on your sweat and grow quickly. That stink is actually the byproduct of that process. You can take several steps to get rid of those odor-causing bacteria. Here are a few suggestions. If you perspire a lot, it is important to bathe your feet regularly. You should do it daily and wash your feet thoroughly using warm water and soap. Simple washing can help get rid of sweat, dirt, and odor causing bacteria. Do not forget to wash around the nail beds and between your toes. Consider washing your feet several times a day if your feet smell. Another good way to get rid of bacteria and dead skin cells is to exfoliate your feet often. You can use an exfoliating scrub or opt for a pumice stone to scrub your feet properly. Do not forget to trim and clean your toenails to reduce bacteria. Finish by moisturizing your feet. You just cannot learn how to get rid of smelly feet if you do not know how to keep your feet dry all the time. Odor-causing bacteria thrive in moist areas, so it is important to keep your feet dry. Never wear damp, sweaty socks and shoes. Be sure to dry your feet off after you take a bath. Use rubbing alcohol to wipe the area between your toes. If your feet sweat a lot, you may consider making use of antiperspirants on your feet. These products contain chemicals to reduce sweating. Avoid using deodorants because they only mask the smell and do nothing to treat the underlying cause. Spread it onto your feet before going to bed, so it could penetrate into your skin and produce good results. It is also a good idea to use antiperspirant before putting on your shoes. Wondering how to get rid of smelly feet? Shoe washing is essential. Washing your feet is important to get rid of bacteria, but you should also wash your shoes regularly to ensure there are no odor-causing bacteria hidden there. 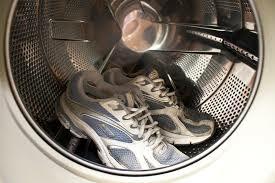 You can wash your shoes in the washing machine, but be sure to add some baking soda to the water to remove the stench. Lavender oil not just masks the smell but it also works to eliminate bacteria from your feet. It also has antifungal properties, which protect you from dealing with fungal infections. Take some warm water and add a few drops of lavender oil to it. Soak your feet in this solution for 20 minutes. Repeat two times a day to get good results. 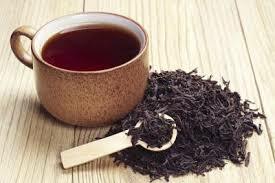 Thanks to the presence of tannic acid, black tea has antibacterial properties and is effective against odor-causing bacteria. It also works by closing pores on your feet and making you sweat less. Take 3 cups of hot water and boil a couple of black teabags in it. Now, take half a bucket of water and add it to the mixture to lower its temperature. Soak your feet in it for 20 minutes to get rid of smelly feet. Repeat daily for a week to get good results. It is easy to learn how to get rid of smelly feet using vinegar. You just need to make a mixture by combining six cups of hot water and one-half cup of vinegar and soak your feet in it for 15 minutes. Be sure to wash your feet after you have soaked them for long enough. The remedy works because vinegar creates an acidic environment, making it difficult for odor-causing bacteria to survive. You can use a sugar scrub to deal with smelly feet. The good thing is that it will also help remove calluses and dead skin cells. To make a homemade sugar scrub, simply combine clean water, sugar, and isopropyl alcohol. You need to create a thick mixture, so you may have to use more sugar than water. There should be one part of isopropyl alcohol for five parts of water. Use this mixture to scrub your feet. Do it for 10 minutes to get rid of dead skin cells and odor-causing bacteria. Wash your feet in the end. It is also a good idea to soak your feet in warm water before using the scrub. Be sure to do it thrice a week to prevent smelly feet.